If you’re looking for a special treat while in Queenstown, the gondola ride up Bob’s Peak might fit the bill. 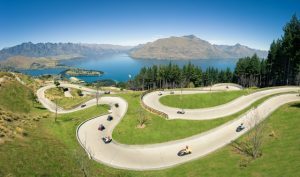 There are amazing views over the whole Queenstown area from the top and you also have the option of doing the luge which is great fun for both kids and adults if you like to have the wind through your hair and have no fear of speed! Age and height restrictions for doing the luge alone apply (5 years and under / under 110cm must travel in tandem with an adult). An additional height restrictions applies to the advanced luge track for 6+ year olds travelling alone (must be 135cm or over). See here for more details. Children under 110cm tall will need to ride in tandem with an adult, and only on the Blue Track. Additionally, only infants who are able to walk and support their own body weight are able to ride with an accompanying adult. Ideally you’d do this activity when the sky is blue and sun is shining BUT it can be done in most weather conditions (it has to be fairly extreme rain or snow for the Luge to stop operating and very high wind or lightening for the Gondola to stop). The best advice is to dress for the weather bearing in mind that it could be wetter/colder at the top. If you’re doing the luge, consider wearing waterproof coats and pants if you have them and hats and gloves are good during the autumn and winter months. There’s a restaurant bar (open from midday) and cafe (open from 9am) that you can warm up in at the top which both serve hot drinks (neither has been specifically recommended but either would be places to wait if you need to escape rain or while other members of the party are doing the luge). Address: Brecon Street, Queenstown. Limited public parking on Brecon Street, so you might want to consider walking as it’s only a 5-10 minute walk from central Queenstown. Open: The Gondola is open daily from 9am with the last ride up being approximately 9pm. The Luge starts operating at 10am closing approximately at 5pm (winter) and 9pm (peak summer). Check closing times here. Price: Gondola only Adults $39, Kids (5-14yrs) $24, Family Pass (2A+2K) $113, Family Pass (2A+3K) $135. Preschoolers FREE. Combination ticket for gondola+luge are worth checking here. It’s worth checking on Bookme here to see if there are any discounts available for when you want to go. Tickets can be bought at the desk or online, occasionally there are daily deals that are only offered at the ticket desk but TOP TIP: Depending on the Gondola + Luge option you choose, the Skyline Rotorua can be very slightly cheaper than the Skyline Queenstown, so if you plan to visit both and can put the kids off, go for Rotorua!